The ubiquity of photography, thanks to the digital revolution, hasn’t diminished our curious fascination with one kind of camera: the pro-style, single-lens reflex camera. 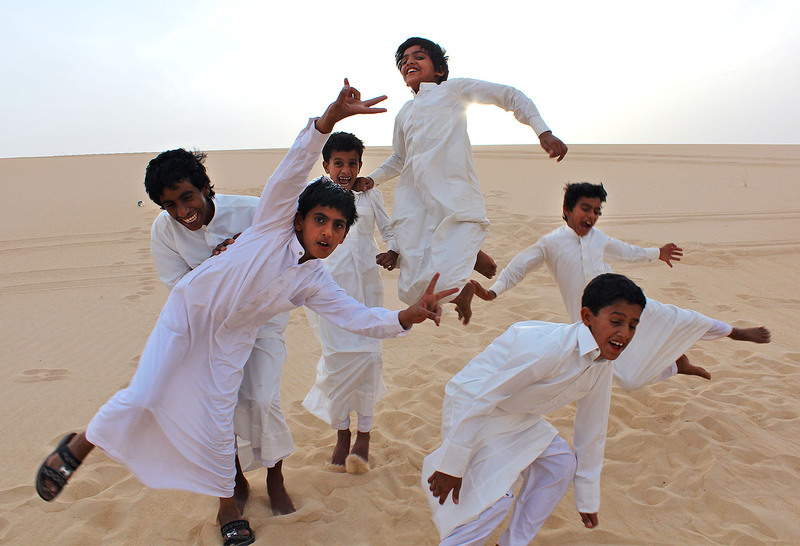 That partly explains the boys’ euphoria in the photo above, taken by Gintare Balseviciute ’13 last May during a Short Term trip to Saudi Arabia. While other students snapped away unnoticed with their pocket cameras, these boys cavorted, wrestled and posed for Balseviciute’s Canon SLR. “When they saw the Canon, it was as if they saw a Lamborghini,” Balseviciute says. The trip to Saudi Arabia was led by Dana Professor of Anthropology Loring Danforth and largely facilitated by Leena Nasser ’12, a politics major from Dhahran. A rare hijab-free mingling of the genders on the Saudi plains. Photograph by Ana Bisaillon ’12. One excursion was to a desert farm in the Eastern Province, where the farm’s owner and family feted and entertained Danforth and the 16 Bates students. A rare hijab-free mingling of genders on the Saudi plains. After camel rides, live music and good food, the Bates group headed into the desert in white Toyota Land Cruisers for sand duning, followed by coffee and dates. At the gathering, the Bates women got the OK not to wear their abayas, so the photo above, and the image at right by Ana Bisaillon ’12, also show a rare hijab-free mingling of genders on the Saudi plains. “Not only are the kids seeing Americans, they’re seeing female Americans. And they’re seeing female Americans in Western dress,” Danforth says. Facebook page African Economist by Desmond Mushi ’13 got 2,000 likes in first month. Viewers from 28 countries tuned in for the livestream of President Spencer’s installation. Bates publishes a guidebook for students returning from off-campus study. 2013 Short Term course revisits an oral history initiative with orphans of Rwandan genocide. Thus inspired, Bettles worked with the Bates Career Development Center to grab some of the fun for Bates and his own institution. The result: performing-arts internships at the Tacchi-Morris Arts Centre, affiliated with Heathfield, that were inaugurated last summer by a current Bates student and a 2012 graduate. “This partnership is exciting because it provides a paid professional internship abroad in the arts, which is unusual,” says Nancy Gibson of the BCDC. Of Bates’ approximately 24,500 alumni, about 580, or 2.4 percent, live outside the U.S. This snapshot taken right before the Mayan end of the world in December shows their numbers and countries.